What object tells the tale of your life? At Historic New England, we don’t just collect historic objects–we also collect stories. Each of the more than 110,000 items in our object collection has an associated story that reveals something about the donors, their families, and New England history. This scrimshaw, acquired in 1925, tells the story of a man who survived three shipwrecks, sailed to exotic lands, and hunted aquatic beasts, all during a small stint in service to the sea. Samuel Tenney, born in Oxford, Massachusetts, in 1827, worked as a shoemaker’s apprentice until he was sixteen. During his initial years as a sailor, he served in the Navy on board the U.S.S. Brandywine, which carried out operations in the waters around China and Brazil. After receiving an honorable discharge, he continued his work as a sailor upon a whaling vessel, until he settled down in 1850. Although he sailed for a relatively short time, his love for the sea never died. He filled his home with relics and models reflecting upon these years. 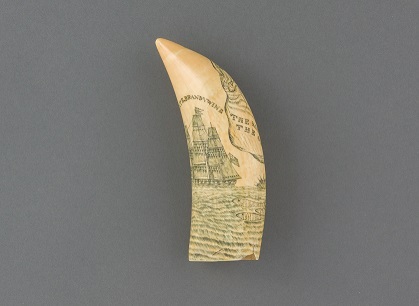 One such relic is the scrimshaw he carved aboard the whaling vessel, which is now in the collection of Historic New England. Scrimshaw is the art of carving or incising intricate designs on whalebone or ivory. The art of scrimshawing became extremely popular two hundred years ago, when whaling was a common profession. During their idle time, sailors used knives and needles to etch and carve their designs into bone and ivory. To illustrate these designs, they would add a dark substance, such as soot from a stove, squid ink, or ground-up gunpowder, into the carved grooves. 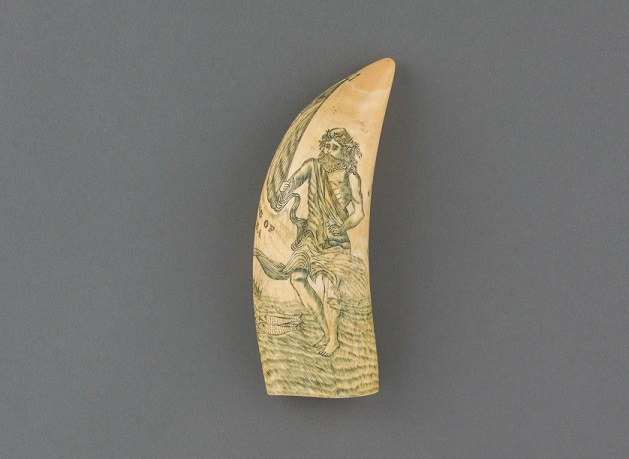 Scrimshaw depicts a broad range of subjects, most of which were very personal to the artist or “scrimshander.” This personal touch is present in Samuel Tenney’s scrimshaw, which reflects his pride in his service to the U.S. Navy and his great respect for the sea. Etched into the whale’s tooth are an illustration of the U.S.S. Brandywine and a portrait of Poseidon, the Greek god of the sea. Today, the trade and collection of ivory-based goods is highly controversial. Restrictions passed by the U.S. federal government in 2013 limit the ivory trade in order to prevent the population decline of African elephants and other species hunted for their ivory. In May 2014, an amendment was added to allow antiques and objects collected before 1982 to qualify for an exemption, so that museum artifacts can transported with limited risk. Learn more in this Maine Antiques Digest article and on the U.S. Fish and Wildlife Service website. Read more about interesting objects we are working on as part of the Historic New England Collections Care Project. Help preserve the objects and stories of New England’s past by donating to the Collections and Conservation Fund.